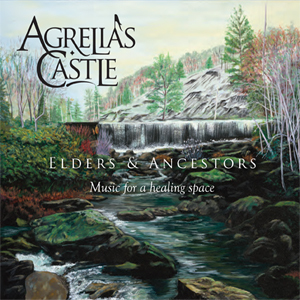 Agrelia’s Castle – ELDERS & ANCESTORS: The image you see above is of two very special musicians; husband and wife Paul and April Brown created the beautiful music on this release as a part of their journey together through the challenges of cancer. I have listened to (literally) thousands of songs that use electronics, flutes and vocals to enhance your spiritual connections, and can say (without qualification) that this one, particularly on pieces like the opening title track, “Elders and Ancestors” (14:23), capture the beauty more poignantly than anything I’ve listened to in the last 10 years. As you listen to April’s vocal work on this one, you will know the true power that music can bring to life – I loved this piece! The playing is primarily by April and Paul, but they did add some talent to assist them with the production of these beautiful tunes – Paul plays Hammond B-3, Fender Rhodes, Keyboards, Drums, Percussion and April does Vocals, Native American Style Flutes, Drums, Percussion, BGVs and they are joined by Mike Farris on Vocals (Track 6), Tom Shinness doing Harp Guitar, Guitar, Cello, Bass Guitar (Tracks 3, 5, & 6); and Richard Cushing playing Sitar (Track 3) – and the talent they have assembled is clearly up to the task, especially on their rendition of the traditional “Wayfaring Stranger”… it runs for 10:22, giving plenty of time to build the tune from the flute intro to a full-bodied magical experience like you’ve never had… Mike’s vocal on this one is just WONDERFUL (this was the tune that I learned how to sing solo spirituals on many, many years ago – so it’s definitely a favorite) and will fill your heart with both sadness and joy! What is most noticeable about what these two folks project through their music is the contentedness and peace they have in life, and they are able to do that without coming across (in any way) as pretentious, or “too new-agey”… having just been diagnosed with prostate cancer myself, I feel their message conveyed most effectively on tunes like the beautiful “Spirit Dreaming”… the mix of vocals, flutes and powerful keyboard work made this one my personal favorite of the seven offered up for your pleasure and enlightenment; I listen to this tune whenever I need encouragement (much more often these days, I can tell you). Peter Calandra – FIRST LIGHT: It was only a few seconds into the first album I reviewed from Peter, “Inner Circle“, that I knew he was going to get very high marks in my review (issue 145, by the way) – I was particularly impressed with his string/synth work. On his latest effort, to be released in September, 2015, you will be (quite simply) astounded, as you are left with memories of compositions like the 4:09 title track “First Light“… it’s clear that the spirit was guiding him on this exceptional piece, and (again), the strings/vocal strings are just superb. Peter is the kind of player who lets his music speak for itself, without the usual hype… he has scored over 40 films, and done numerous TV themes (as well as many Broadway shows) – so even though you may not have caught his name in the credits, you have probably witnessed his incredibly buoyant musical signature. His piano style is full-bodied and lively, painting sonic imagery with every note he coaxes out of his head (& through his magical fingers). It helped that he grew up with music all around him, and had parents who supported his forays into the professional side of music – his mom, an amateur musician herself, nurtured his musical side even as he started out his career doing the “gig thing” at bars doing blues, funk & other styles; his big break came when he was asked to sub in an off-Broadway production of “Little Shop of Horrors” – and the rest is history, as they say. You can, of course, find many more of his works on YOUTUBE by searching his name there. I’m sure there will be some of the songs from “First Light” posted there after the September 21st release, too. 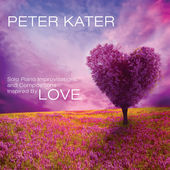 Peter Kater – LOVE: I first reviewed Peter’s wonderful contemporary piano/keyboard works in issue # 129, on a release called “Light Body“, and it was evident that his extensive travels and well-honed talent (he started out learning classical piano at the age of seven) gave him an ability to express emotions through his playing that few other artists can lay claim to… words like “inspirational” and “healing” came to mind immediately as I wrote that review. He also got very high marks for his work on an album in 2014 called “Ritual” in issue # 145. On “Love“, he explores an even wider range of feelings associated with that most powerful emotion. Over my many years of reviewing music, I can honestly say that I haven’t heard a solo pianist capable of drawing the listener into their tale as deeply as Peter can. That is made clear (most poignantly) on tunes like the beautiful “Union“, a wonderful improvised piece that touches the heart intimately and brings understanding of how powerful two spirits merging can be. What makes Peter’s playing so unique is the pacing of each of the pieces… you’ll hear the power he’s able to project on the 6:08 “Turbulence” and know as you listen that this song comes from experience… the power of moving on from situations that have become too difficult to continue. Peter’s early days (after growing up in New Jersey) were spent hiking ’round the U.S.A. with a backpack, his music books and his talent to help sustain him. 30,000 miles later, he wound up in Boulder, Colorado, where he incorporated many of the musical lessons he had learned into his playing… his unique and powerful style allowed him to do small concerts throughout Colorado & ultimately, with the help of folks like Robert Redford, John Denver and many others in the entertainment world, he was a recognized name on the world stage. I can tell you as I listen to his beautiful composition on “Two Of Us“, that very few keyboardists in the world today can convey such a sense of intimacy as Peter did on this fine two-chord song (the only one he’s ever written with only two chords). I don’t think any listener will be able to walk away from Peter’s improvisation on “Intimacy” without remembering a person who they were able to share their deepest secrets with, and cherishing that memory. Peter’s keyboard work is simple, yet stunning, and for folks who want musical inspiration to keep their love burning bright, these thirteen wonderful tunes will do just that. Oftentimes, solo piano is just classified as “New Age”, kind of lumped into that category, anyway. That’s another thing that makes Peter’s work so noticeable and pleasant to listen to… it goes far beyond that label, and takes the listener into sonic realms that approach the music on a much more personal level… and he’s got the “life” and “road” experience to back it up! A perfect combination for a perfect album! You can get a wealth of information on this high-energy (and high-talent) player at Peter’s website. I give him a MOST HIGHLY RECOMMENDED, with an “EQ” (energy quotient) rating of (a perfect) 5.00… meaning he also gets the “PICK” of 2015 for “best contemporary instrumental album”.